Undoubtedly Samsung wants to overcome Apple, their main competitor in the US, and this can be noticed from their latest announcement. The Korean giant is preparing to open more than 1000 small retail stores inside Best Buy shops around the US. All this is already starting in April. They said they are preparing even more openings after May. The name chosen for the stores is Samsung Experience Shops. Apple has the same idea put in their retail stores, so Samsung definitely had to make a move. The mini shops will have smartphones, tablets, laptops and other Samsung products that people can come and try before making their buying decision. 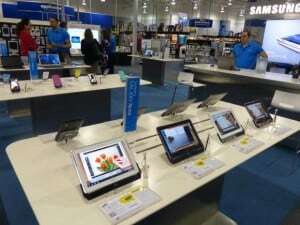 Besides showcasing their products, some stores will also have a section called Samsung Smart Service. They will be staffed with Samsung Experience Consultants that will be able to give you detailed information about the products you want to buy and how to service them. Again Apple has something similar with their Genius Bars and Geniuses.